Power Equipment Direct and Toro have teamed up to offer you special financing and promotional offers through Citi. 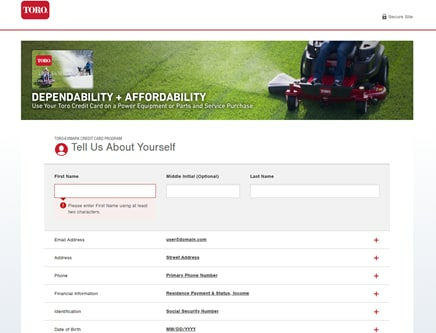 Purchasing Toro products couldn't be easier! Simply follow the steps below and be on your way to financing your equipment in seconds. The next time you use your Toro, you'll have to keep from smiling! 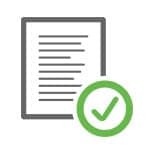 If your order qualifies for a special rebate promotion, you must select the corresponding plan and fill out the rebate form. You may submit the form online, by mail, or fax. Full instructions are on the Rebate Form. Once you submit your rebate, you may track it by going to the Toro Rebate Center. On new Toro TimeCutter® or TimeCutter® HD product purchase of $2,000 or more. Interest will be charged to your account from the purchase date if the purchase balance is not paid in full within 12 months. On purchases of $500.00 or more. 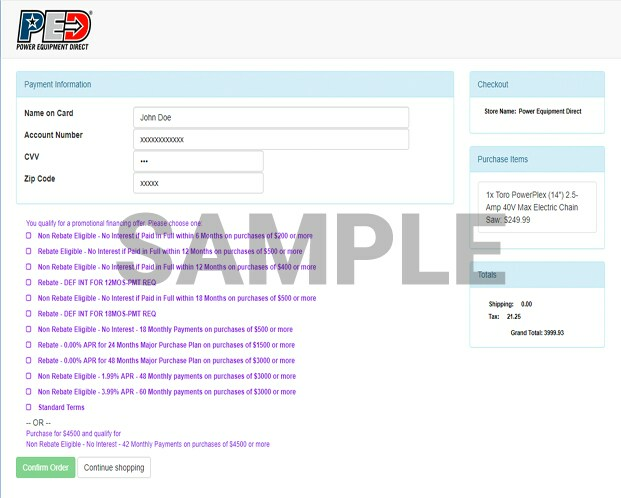 Interest will be charged to your account from the purchase date if the purchase balance is not paid in full within 12 months. Receive up to a $50 Visa+ Prepaid Card by mail-in or online rebate. Learn More or click here for details. Offer valid 3/1/19 – 5/31/2019. Get Special Financing on Toro.. Our Power Equipment Direct how-to library can help you learn about Official Photo Contest Rules, What to Do When Your Engine Fails and Proposition 65 Product Labeling.